I love living in Perth, many people ask if I have plans to move away, and while I’d love to travel more, my heart belongs to Perth! My dream is to continue adding to all that Perth has to offer especially on the pinup/vintage front as this is what I’m most passionate for. In the last few years more and more exciting things have been taking place here, and it’s important for us to support these events so they and others take place. Over the weekend I had lots of vintage fun and thought I’d share some of the fabulous photos with you all! On Saturday The Perth Pinup Community took part in a fashion show with Cherri Lane Clothing at Millen Primary’s School’s 60th anniversary fete which had a 1950’s theme as they’re school was founder in 1956! Hanging out in the quadrangle before the show! All the pinup girls after the show! From left to right we have Peggy Jean, Elsie Darling, Sherri Shortstack (front row), Dolly Von Blonde, Miss Lady Lace (front row), Avalon Arrowheart, and Luna Star. The event itself had a splendid turn out and included so many different fun activities including rides, gymnastic displays, markets, pinup makeovers for kids, bands, live performances, our fashion show and so much more! We had an amazing time taking part, as well as having fun walking around the markets, and getting up to lots of vintage mischief! Thank you so much to Cherri Lane for providing the fabulous outfits we modelled, thank you to the pinups for attending the event and for taking part in the show, and finally thank you to Millen for putting on a fabulous event! A pre-show selfie with Dolly Von Blonde, and Peggy Jean! On Sunday my sweetheart and I attended The Guildford Heritage Festival which was fabulous with a whole range of displays including antique prams, machinery, cars, markets and so much more. This day was very hot though so we did not stay too long as I felt quite faint after being there for a little while! For this event I wore my fabulous apple dress and red bow belt from Cherri Lane, coupled with vintage jewellery accessories with my favourite piece being my strawberry earrings I bought from the Polka Dot Vintage Market, and a cute vintage bag I bought from an op shop! I really love this outfit as it has such a classic romance look, and it’s just quick zip, and belt buckle away from being fabulous! I was also so very lucky to run into some vintage friends, I sadly did not get photos with all of them, but Joanna, Brooke and I stopped and had a chat for a while and managed to sneak in a few selfies in our decadent vintage attire! I’ve met so many amazing friends through vintage markets, and through The Perth Pinup Community, attending events such as this are made so very special when you run into some amazing people. 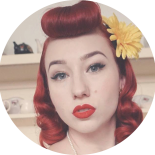 Be sure to stay tuned for more fabulous vintage blogs, this week I have planned a blog on healthy eating, a video on pinup confidence and journeys, my Friday’s Vintage Cocktail post and much more! This entry was posted on April 5, 2016 by Miss Lady Lace in Pinup and tagged 1940's, 1950's, 2016, australia, blog, blogger, glamour, guildford, Lady Lace, millen primary school, miss lady lace, miss lady laces pinup blog, nicole, perth, perth blog, perth burlesque, perth pinup, perth pinup blog, perth pinup community, pin up, pinup, pinup blog, pinup blogger, pinup fashion, pinup girl, pinup life, pinup lifestyle, pinup perth, red lips, retro, retro blog, retro girl, retro glamour, the guildford heritage festival, the perth pinup community, victory rolls, vintage, vintage blog, vintage blogger, vintage fashion, vintage girl, vintage glamour, vintage perth, vintage pinup blog.